Those of us who loves Enger's first novel Peace Like a River, couldn't believe our good fortune, when his second novel arrived. It had been a long wait, seven years; I'd about given up, thinking Enger was a one book wonder, it happens. While both books could be described as a heroic quest, a tragedy, a romance, and a meditation on the possibility of magic in the everyday world, they are also different. The current offering is a rugged and nimble story about an aging train robber on a quest forgiveness, and the blocked writer who goes with him. 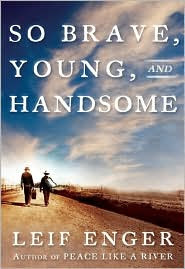 The writer’s inviting voice guides us through this expansive saga of redemption in the early West, circa 1915, and gives a teeming vitality to a period too often represented with stock phrases and characters. I am very impressed with Enger research, I’d compare his research to Lamour’s; he gets time, place and history right. He doesn’t write fantasy.